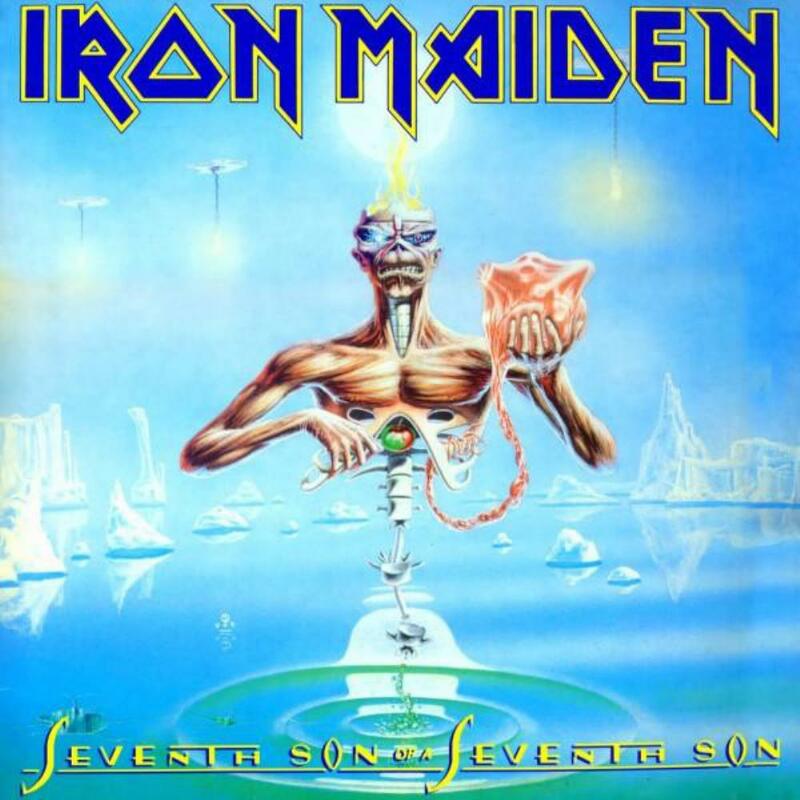 Seventh Son of the Seventh Son is Iron Maiden at their peak. After this excellent and ambitious album, they just started declining in quality, with 4 somewhat weak albums until Brave New World was released. This is a concept album, and while it does not connect musically as well as Pink Floyd's "The Wall" and any Neal Morse solo album, it is still a very enjoyable set of songs with some musical ideas that are shared among songs here. This album also shows Iron Maiden attempting to sound more symphonic, with the help of keyboards. Introduced by an acoustic motif and electric keyboards, Moonchild is among Iron Maiden's best opening songs in an album. An irresistible fast-paced rocker with very memorable choruses (check out the guitar riff in them) and brazing guitar playing. The energy and arrangements make Moonchild a highlight of this great album. Infinite Dreams is a synth-heavy (for Maiden) complex tune with tempo changes. A very solid composition that is a favorite among many Iron Maiden fans. Can I Play With Madness is an upbeat song that sounds quite out of place in this dark album. The quality of the song doesn't help also, being possibly as annoying as "Die With Your Boots On" and "Running Free". The Evil That Men Do is a more straightforward song, but it does not mean that it is weak. It's riffs, chorus vocal melodies, and solos are enough to stop it from being a low point in the album. Seventh Son of a Seventh Son is the best song of the album, even better than the wonderful Moonchild. Not only that, but it may also be my 3rd favourite song in the entire discography of Iron Maiden, behind The Trooper and Paschendale. The track starts with a guitar melody that will later appear faster-paced in the closing track. Great melodic verses and heavy and faster-paced choruses make the first half of the song excellent. Check the drumming in this song, it is one of McBrain's shining moments. After the second chorus, a nice guitar line is repeated until it abruptly stops and a mellow, yet fast-paced atmospheric section with bass, guitars, synths, percussion, and narration. Later, you hear vocal chorus and soft and echoed electric guitar riffs. It starts growing and growing until it turns into metal again. This mellow section is absolutely brilliant and is what" Rime of the Ancient Mariner" failed to achieve. Now, there is metal with excellent and virtuosic guitar soloing and more epic vocal chorus, ending the song with possibly the heaviest section of music Iron Maiden has ever done. The Prophecy is another excellent song in the vein of Infinite Dreams, with tempo changes, and somewhat complex and inspired songwriting. I love the ending when the electric guitar riff fades out and an elegant acoustic guitar solo plays for a minute. The Clairvoyant and Only The Good Die Young are simplier fast-paced metal songs that are more anthemic and seem like good choices on a live setlist. All in all, Iron Maiden's greatest artistic achievement is here and after this album, they will release a very weak and uninspired "No Prayer for the Dying", an ok, but disappointing "Fear of the Dark" which at least has a great title track, an experimental but somewhat dull "X-Factor" with a bad singer, and a total disaster "Virtual XII" until they finally started releasing good quality albums again. Anyways, highly recommended for anyone who enjoys good music and a bit of metal.